Barley has established eminent connections throughout time; ‘Cailleach n’am braice’ meaning Great Mother, is the Gàidhlig Goddess of barley. The Empress card in the Tarot symbolises the Great Mother, the original goddess creator. She is directly connected with Demeter, and to passion and sexuality. Her iconic image shows her holding stalks of barley. Her long, rich yellow hair flows in furrows reflecting the golden ripeness in the fields. 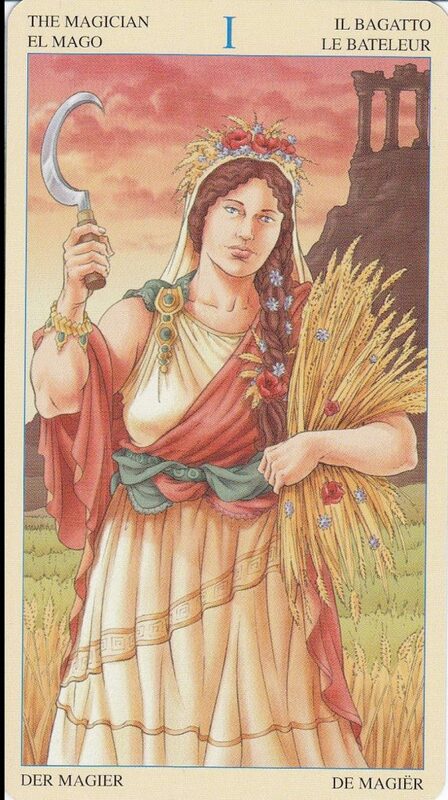 Greek Demeter, Roman Ceres, Slavic Zemyna are all barley Goddesses. Barley is a symbol of Persephone and the constant hope of renewal in spring. Miyolangsangma, Goddess of the world’s highest mountain, (Mount Everest) is depicted astride a tiger whilst carrying a bowl of barley, by her side a mongoose struts and spits jewels. The currency of our commerce begins with barley. Nissaba, the Eastern Mediterranean Sumerian Goddess of writing and accountancy is also the goddess of barley. Nissaba’s epithet is Nun-baršegunu which translates as “Lady whose body is the flecked barley”. Laksmi, the Hindu Goddess of wealth is another female diety connected with barley.